It’s a Monday afternoon in Bozeman, Montana, where 30 minutes after arriving at The LARK, my home base for the duration of the trip, I was out the door again and headed south toward the Spanish mountains. I passed a cyclist pedaling up hill before driving over the dam of the Hyalite reservoir where people canoed in front of snowcapped peaks. Once I reached the trailhead, I set off up the relatively flat one-mile walk to Palisade Falls. What I saw at the top wasn’t just the popular waterfall, but quite a range of locals taking advantage of the outdoors so close to home. Though best known for being the landing point to ski destination Big Sky, Bozeman also hosts a number off-season outdoor sports. In a place like this, it isn’t hard to find yourself compelled to be active. With a smattering of yoga studios and bike rental shops downtown, it is easy to get moving and stay active. Get outside with Paste Travel’s top five outdoor retreats in Bozeman. The trails near Bozeman are wide, well marked and maintained. Self-guided day hikes are a breeze to find and plan. Whether it’s views, waterfalls or elevation hikers are seeking, the trails are varied for all levels and accessible—even to wheelchairs in some cases. Pine Creek Lake winds through forests and opens to the lake in time for a rest and picnic break. Storm Castle Peak is equally scenic with sweeping views all along the ascent. For shorter hikes with big payoffs, head to Hyalite Canyon. In the Gallatin National Forest, Hyalite Creek trail ends at another waterfall accompanied by a natural stone arch. To get more elevation gain on a half-day jaunt, the M and Drinking Horse are about 5 miles northeast of downtown. It’s pretty common to see cyclists on the road here whether they are on the way to work or the trail. Rent from Chalet Sports and bike from downtown to single (and double) track trails with ease. Though road lanes for bikes are not prolific, local drivers leave plenty of room to safely pass. Mountain biking is the way to go in Bozeman, even without experience. Beginners should try Bozeman Creek trail. The six-mile ride from the city center to Sourdough Canyon Road, a former logging route, with views of Saddle Peak is a nice warm up before starting up the double track. Be mindful of hikers and their canine friends the first couple of miles along the mile-marked trail. Climb to the bridge or on to Mystic Lake, then take a breather. If the pristine creek-side ride leaves you wanting more, turn down Sourdough Canyon trail for added mileage. Montana Whitewater is great for kayak rentals and group trips while Madison River Tubing is a better alternative with options including fishing crafts, paddle boards and tubes for those just looking to get on the water. Take to peaceful lakes and slow-moving rivers, or get an adrenaline rush from whitewater rapids. For an afternoon of slow exploration, the reservoir in Hyalite canyon is an optimal canoe put-in point. Paddle across still waters to reach a better vantage point for dramatic scenery. Whitewater rafting is at its most adventurous in late spring and early summer when the snow runoff pours from the peaks. Gallatin River is a good option for beginners as well as experienced rafters. With class I-IV+ rapids, it isn’t hard to find a section of the river to please anyone. 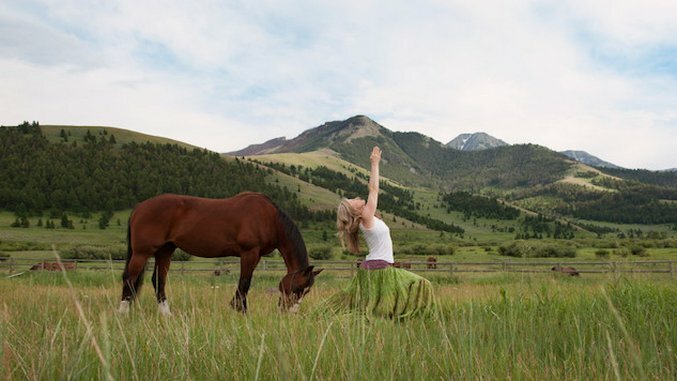 Spend a weekend perfecting form and studying photography in daily workshops with a Yogatography retreat at Big Sky Yoga. Designed to strengthen yogis’ connection to nature, the weekend retreat will also sharpen the photographer’s eye. Get up close with horses to gain a new perspective and savor gourmet meals paired with local wines and brews in the evenings. Margaret Burns Vap, the owner of Big Sky Yoga as well as an instructor for roughly 20 years, guides guests through their trip whether it’s yoga or hiking. With tips on staying hydrated at elevation, yoga poses on hikes to beat soreness and deep breathing exercises, she helps visitors adjust to their surrounding while soaking in the scenery. Vap makes it a priority to highlight the best of her community with suggestions for downtown Bozeman and a gift of local products made by companies that give back to cancer patients, a cause close to her heart. Relax and reconnect with your center in an urban space with Bozeman Ashiatsu. Those looking for a lighter weekend closer to downtown can opt for single class drop-ins or purchase a five-class pass for more time on the mat. After pushing the body to its limits, indulge in a hot stone or Swedish massage. However, don’t be afraid to try something new. Bozeman Ashiatsu owner, massage therapist and yoga instructor Lisa Laird brings the art and her love of ballet into the treatment room for a deep-tissue ashiatsu massage. Where to Fuel Up: Start with a hearty breakfast at Nova Café, and find snacks for the timeouts at Bozeman Co-op. Where to Drink: After a long day outside, get a brew at Montana Ale Works. For something different, try Plonk for wine. Where to Sleep: The LARK may look like a motel, but it’s hotel services and community design take it over the top. From weather reports to finding another trail to take on, the staff guides maximize guests’ time. Molly Harris is Paste Design’s assistant editor and a freelance writer based in Athens, Georgia.